There are numerous images of the neighborhood in the postwar period, when it was one of many historically African-American urban communities that were gradually being displaced by a host of renewal schemes. The Temples’ home for more than a century would fall to the wrecking ball when Indiana University-Purdue University, Indianapolis (IUPUI) was expanding in the late 1970’s. The city of Indianapolis was simultaneously razing a host of businesses along Indiana Avenue, and in the 1960’s the interstate was being constructed through the predominately African-American near-Westside while it sliced through much of the eastside and southside as well. As blocks of buildings fell along Indiana Avenue in the 1970’s the city also lobbied for the demolition of Lockefield Gardens, which closed in 1976. Lockefield was a segregated Public Works Administration community that opened in 1938 across the street from 550 Minerva Street, with School 24 in its midst. In July, 1983 demolition finally removed all but seven of the original Lockefield buildings. Like numerous postwar American urban campuses, the neighborhood now lingers only in memory, with the Minerva Street homes falling to the wrecking ball in about 1980. Photographers documented much of the neighborhood in the postwar period, but the vast majority of those images were predictably ideological representations of the predominately African-American community: some images were in service to slum clearance programs by the state and university; others attempted to preserve a visual record of the neighborhood’s historic architecture; and a flood of subsequent images by the University documented the new campus that rose in the wake of mass clearances. In contrast, Ralph Temple’s painting, his family’s photographs, and their century-long story captured a much different imagination of the African-American near-Westside. Nevertheless, such African-American visual and historical representations of Indianapolis’ near-Westside are often ignored because of a deep-seated assumption that the neighborhood was a materially impoverished place. 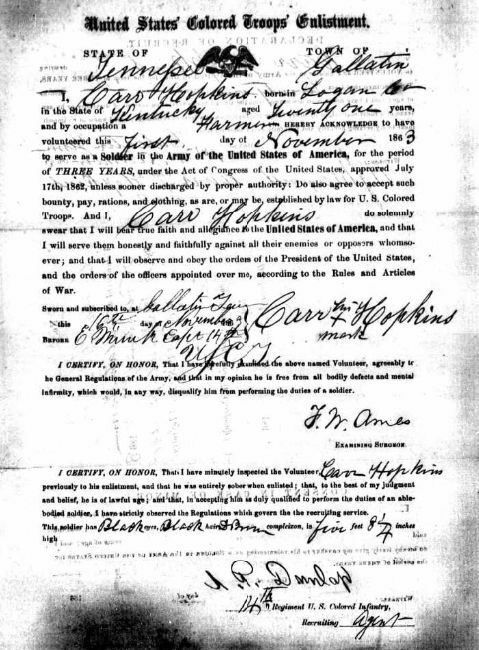 Carr Hopkins’ 1863 enlistment in the United States Colored Troops. Carter Temple Sr. was born in Virginia in about 1811 and came to Indianapolis immediately after the Civil War. Temple probably had been enslaved in Kentucky prior to Emancipation, and he settled on Minerva Street in about 1866. His son known as Carr Hopkins was born into captivity in Kentucky in 1843, and when he was freed in 1863 he volunteered for the 14th Regiment Company C of the United States Colored Troops in November, 1863 in Gallatin, Tennessee. He was appointed Corporal in April, 1864 before mustering out in March, 1866. Hopkins joined his father in Indianapolis and began to go by the name Carter Temple, Jr., using it as his name on his 1871 marriage license and on his military pension, which identified Hopkins as an alias for Carter Temple Jr.
Carter Temple Jr. posed for this undated image after he joined the Indianapolis Police Department in May, 1876. In 1870 Carter Temple Sr. was living on Minerva Street working as a carpenter, and a year later his son Carter Temple Jr. was married in Indianapolis. 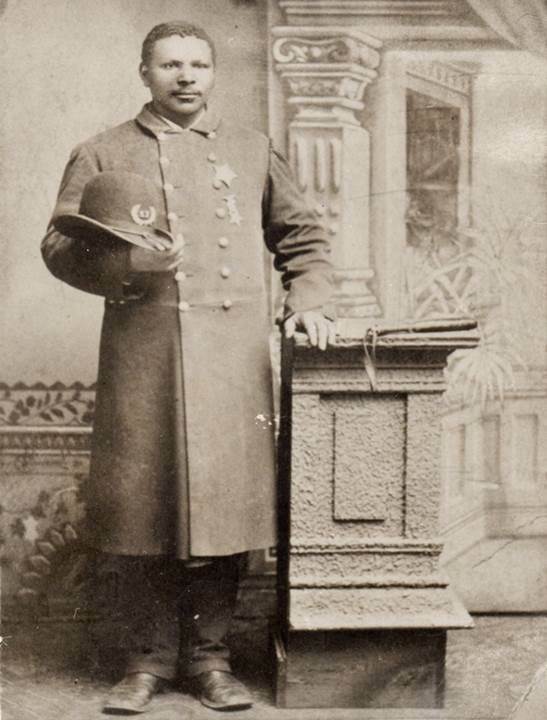 In May, 1876 Carter Temple Jr. became one of the first four African-American police officers in Indianapolis, with the Indianapolis News reporting that “[Sim] Hart, [Benjamin] Young, [Carter] Temple and [William] Whittaker, the colored police appointees, were signed to Ward’s division Saturday night … . These men will do service among the Bucktownites” (Bucktown was a term often used to refer to the African-American near-Westside). In 1889 Indianapolis’ African-American newspaper The Freeman reported that the Indianapolis Police Department had six African-American officers, and “Carter Temple, who everybody knows and respects, joined the force in ’76 and has remained on ever since. He is a Kentuckian, but has lived here since ’65. He owns a good home and has an interesting family. He is one of the finest specimens of physical manhood on the force, standing fully over six feet and weighing over 200 pounds.” Temple served until he was struck by a street car in a 1900 election day accident. In 1888 Temple Carter Sr. died, leaving his estate to his wife Amanda. Among the people receiving benefits in the will was his son Frederick Hopkins, who was a police officer living in Vicksburg, Mississippi. When Hopkins himself died in 1898 The Vicksburg Herald indicated that Hopkins “was one of the few colored men who drew a pension for services on the Confederate side from the State appropriations.” Hopkins probably was enslaved by a Confederate soldier and traveling with the rebel army as a captive. Mississippi was unique for sponsoring a pension program beginning in 1888 that extended benefits to African Americans as well as former Confederate foot soldiers. By the time of Carter Temple, Sr.’s death many of his relatives were living along Minerva Street. They included his son George W. Temple, who began a career as an actor, musician, and comedian in about 1880. George was among the city’s earliest generation of African-American performers. African Americans had sporadically performed to White Indianapolis audiences since the Civil War. Brooker’s Georgia Minstrels was probably the first African-American managed troupe to perform in Indianapolis, with the self-described “simon pure Ethiopians” playing three nights in August, 1865 at the Masonic Hall. An African-American theatre and musical performance tradition had emerged in the wake of Emancipation, but in 1880 only one African American in Indianapolis appeared in the census as a musician, and George Temple was the only Black actor. At the turn of the century nearly all of the city’s African-American musicians were in traveling troupes that performed throughout the country, which certainly included George Temple. In 1907 the Indianapolis Recorder noted that “George Temple, the famous comedian, is off the road and is preparing to give ’`Uncle Tom’s Cabin’ here in the City.” Like many turn of the century performers, Temple apparently performed “In an old-time cake-walk at Tomlinson Hall,” with the Indianapolis Star reporting in 1909 that “Wesley Thurman and George Temple, who essayed a woman’s role, were close competitors for the large white cake and a $25 prize.” The “woman’s role” indicates that Temple was performing dressed as a woman, a staple of both White and Black theatrical comedy in the late-19th century. After about 40 years of performing, Temple probably toured with Harvey’s Greater Minstrels, a 40-50 person African-American ensemble that played throughout the country and Canada between about 1918 and 1925. In 1920, George and Edmonia Temple’s sons George Isaac and Walter Temple were both working as musicians. George I. Temple was probably playing with Harry Farley’s orchestra around 1920, and the Batesville Indiana newspaper described “Harry Farley’s Garden Park colored jazz band, of Indianapolis, the grandest colored jazz band in the Middle West. Hear them sing and see them dance—the greatest endurance orchestra in America.” In the 1920s the family moved to New York City where George and Walter joined their parents and were working as orchestra musicians. George Isaac Temple married Fredonia Stewart in 1928 and lived with her in New York until 1949. Stewart’s family had established and owned the Indianapolis Recorder, and after moving back to the Circle City she co-owned the newspaper for 36 years while George would work as an advertising manager. 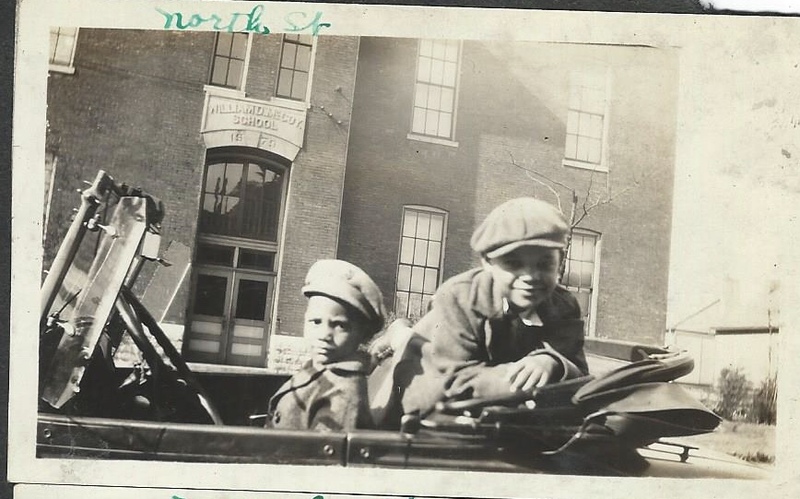 In the late 1920’s, Carter Temple (left) and Ralph Temple (right) posed in a car parked on North Street, with McCoy School in the background (image courtesy Cecilia Boler and Reginald Temple). The family had a distinguished record of military service beginning with Carter Temple Jr.’s service in the Civil War. In 1898 his son Carter Frederick Patton Temple became the second generation to serve in the military when he served in the Spanish-American War. Born at 544 Minerva Street in 1879, Carter FP Temple would live on Minerva Street until his death in 1941, when he was living a few doors away at 550 Minerva. Carter FP Temple became an Indianapolis police officer in 1900, but he resigned a year later and spent the remainder of his career working in construction and served in the Indianapolis Street Commissioner’s Department. Temple and his second wife Lucy Paris Temple had 11 children. One son died as an infant in 1930, but the remaining 10 grew up on Minerva Street, including three sons who served in World War II. Arthur Temple and his brother Carter Paris Temple both served in the Navy, and Ralph served in the Army. 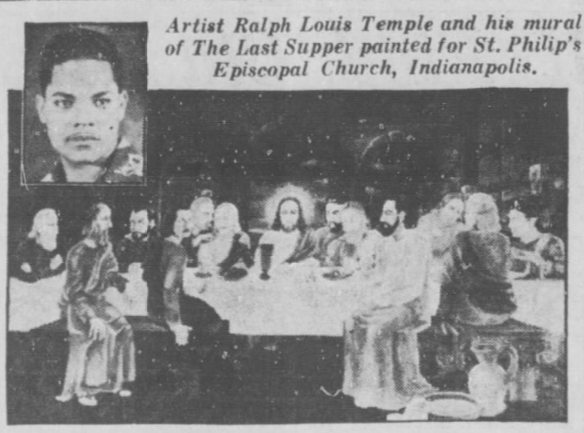 In August, 1942 a Pennsylvania newspaper reported on Ralph Temple’s painting in St. Phillip’s Church in Indianapolis. 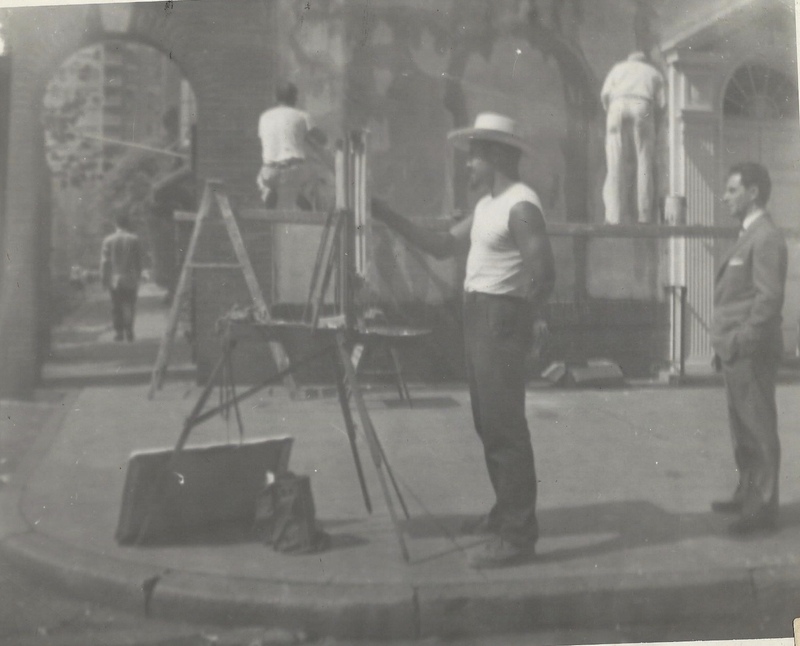 An undated image of Ralph Temple painting (image courtesy Cecilia Boler and Reginald Temple). 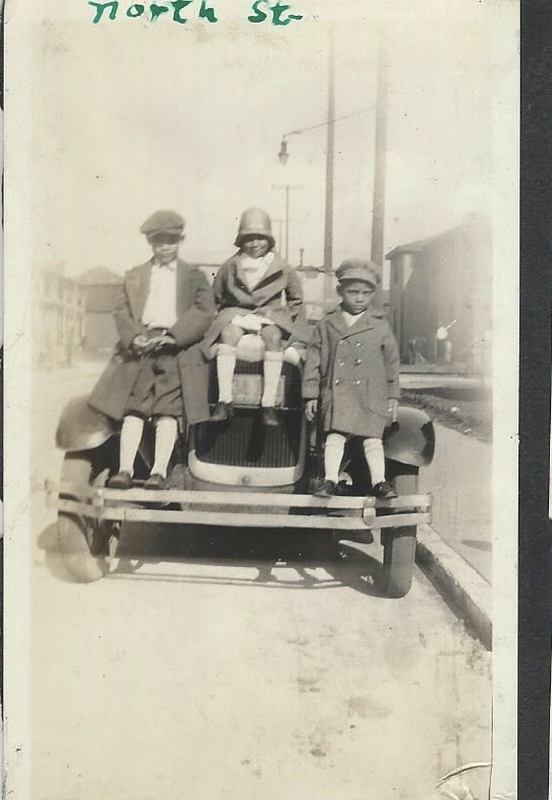 Ralph, Jane, and Carter Temple (left to right) posed for a picture on the bumper of a car on North Street in the late 1920’s (image courtesy Cecilia Boler and Reginald Temple). 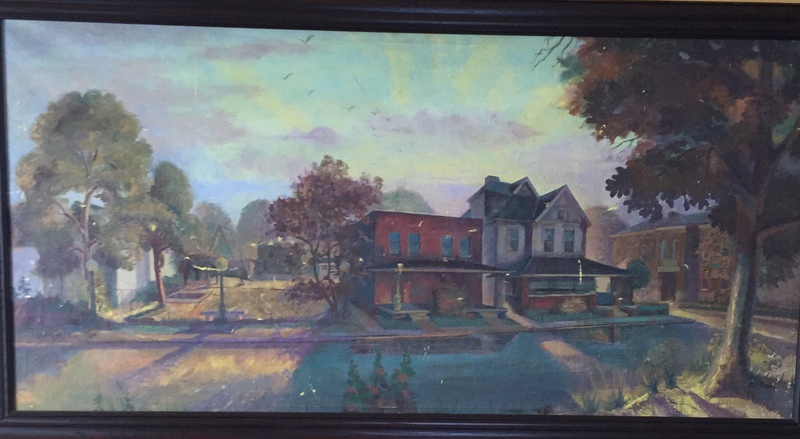 Ralph was living at 550 Minerva Street and identified as a student between 1949 and 1951, when he may have been completing his Herron coursework. He appears to have left Indianapolis in late 1952 or 1953 for New York, and he was living in Manhattan in 1957. Ralph lived in New York for the rest of his life, passing away there in 2011. Much of his family continued to live on Minerva Street into the 1960’s. In 1960 Carter FP Temple’s widow Lucy was living at 550 Minerva Street with her daughters Cecilia and Jane. Jane worked in a neighborhood institution, Berky’s Market, which opened on West Michigan Street in August, 1948. Max Berkowitz had operated a meat market on Indiana Avenue beginning in 1928, and Jane probably began to work in Berky’s from the time it opened. She would work for Berky’s until 1960, when she began working at Western Electric and moved to West 28th Street. Cecilia and Lucy were still living in the home in 1970, by when IUPUI had opened just two blocks south of their home. The Indiana University Hospital had been acquiring property around the former City Hospital since the 1920’s, and by the early 1960’s Indiana University was acquiring properties for the undergraduate institution that became IUPUI. In 1978 Lucy and Cecilia Temple appeared in the city directory at 550 Minerva Street for the final time. Lucy Paris Temple had been living in the home since the eve of World War I, but in about 1979 she was compelled to move out of the 550 Minerva Street home to a northwestern Indianapolis suburb, where she died in 1984. In 2017, her son Robert Ricardo Temple died, the last of her 10 children who had lived to adulthood. Photographs of the neighborhood after 1960 tended to support the notion that the community was a universal “slum,” less a visual description of the neighborhood than an ideological rationalization for the displacement of its residents. 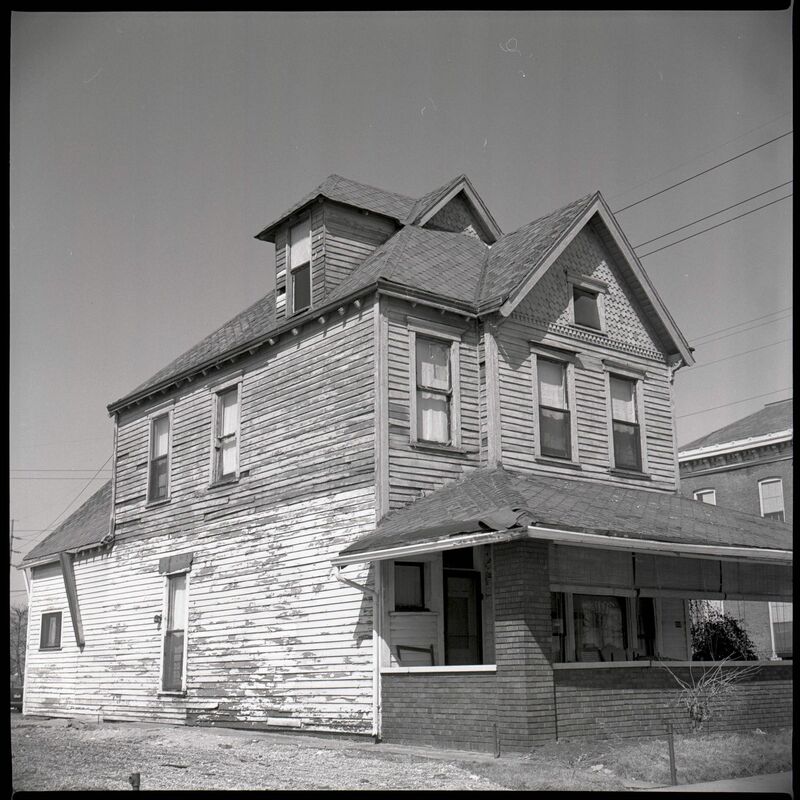 A photographer took pictures of 550 Minerva Street sometime around the moment the last Temples moved out of the home, and it remained a sound structure, but the University was intent on securing the properties along Minerva Street, which would be the heart of the IUPUI campus. After the Temple home was razed, the Lincoln Hotel and University Conference Center opened in the same space in July, 1987 for the Pan-American Games; when the Lincoln firm went bankrupt five months later the hotel began to be referred to as the University Place Executive Conference Center and Hotel, and it is today known as University Tower. The North Street doors to the building stand where the Temples’ home sat for more than a century. Posted on October 16, 2018, in Uncategorized and tagged #WPLongform, Indianapolis, IUPUI. Bookmark the permalink. 1 Comment.